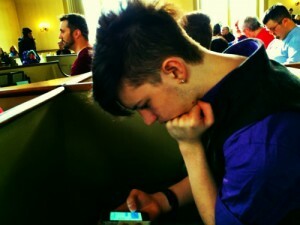 Teenager using cell phone in church, Photo by the author. Growing up Online: Kids today are growing up connected in ways my generation never was. With that comes new challenges and new ways to try to understand the world. As a parent, I think about this daily and have found a lot of other parents struggle with this. I am hoping that together we can make sense of all of this. Or at least commiserate together! Full Access: Ten years ago, I was a pioneer in accessible web design. Back then, using CSS to separate layout from content was a new thing and few people were doing it. At the time, I was designing and building websites for the Federal Government, which are required to be accessible to comply with Section 508, part of the Americans with Disabilities Act, and the idea of this type of design was nothing short of radical. My instructions were to create two sites, one graphical, the other text-only. I had to sell the idea that a single site could serve the needs of all users. Today this is standard (and yet still not widely done). Moving beyond just websites, I am interested in the concept of full access for everyone regardless of device or method of access. And moving beyond that still, I am interested in full access to the online world for everyone regardless of economic status. In other words, how can we get full participation by everyone? Leadership: I have been managing individuals and teams for over twenty years. For the last seven, or so, I’ve been involved with youth leadership (mainly Cub and Boy Scouts but in other contexts as well). I am very interested in what makes a good leader and how we can grow our future leaders. I want to examine what makes a good leader and how those skills can be taught. Project Management: This is more of a sub-case of leadership but it is also fundamentally different in that, in addition to managing people, it is also about managing resources and time. I have learned a lot in my many years in this role (regardless of the many titles I have held, it all really does come down to this almost every time) and want to share what I know and learn what I do not. Miscellany: These bucket is a catch-all for things that don’t neatly fit into the other categories as well as meta-posts (like this one). I had the idea for this blog and I sat down to explain it to my wife. I said, I need to find a good name for all of this. I need to find a good thing to call these various, disparate thoughts that are, essentially, my figuring out how to understand how our world is changing. “It’s all about navigating the waters. I just don’t know what to call it.” She said, “How about ‘Navigating the Waters?’” I blinked, checked the domain registry to see if it was even available. Five minutes later, this was born. I have no doubt that whatever begins from the seeds I am planting today may not look anything like what I have detailed above. But it’s a start. I hope that you will join me on this journey and contribute your thoughts. Comments will be open on all posts for two weeks (so discussions are bounded) and all opinions are welcome. I will be culling anything that is nasty or belligerent. Disagree with civility, respond with respect. And if that gets too difficult to manage, we’ll figure something else out. But I figure this should be something we can explore together. That’s the theory, anyway. The plan is to do one major post a week and any number of smaller posts (links, etc.) as needed or as I discover things worth sharing. Well, that’s enough of an intro. It’ll be fun to look back at it in a few years and see how prescient or how naive I was. But until then, let’s plough ahead!